Wouldn't it be great to have your own personal trainer? A personal trainer could evaluate your fitness level, design a varied workout customized to your fitness goals, abilities and available tools and lead you through that workout. Your trainer would periodically ask you how you're doing and adjust the difficulty level, stopping to explain the tricky bits or to rest for a bit. At the end, he/she would congratulate you on a job well done and remind you of the next scheduled workout. Why haven't you got one yet? Well, it's inconvenient to get to the gym and to coordinate your schedule with somebody else. And it's expensive to pay somebody just to help you exercise. And maybe you don't want to feel like you're being judged or are wasting somebody's time (or failing to get your money's worth) when they keep having to stop and explain all the moves. Maya is your personal trainer. 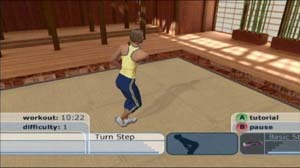 All you have to do is buy a copy of Yourself!Fitness for your platform of choice - you can get it from Amazon for PS2, XBox, or PC. Maya will tailor the workouts to the tools you have - for the full range of activity you'll eventually want to get hand weights, a stability ball, a step, and a yoga mat, but you can get started without any of these. Maya can also lead you through yoga exercises to relax you and improve your flexibility. This is not actually a game, but it does fall into the category of using videogame technology to make getting in shape more convenient and enjoyable. Like cereal brand X is "part of a well-balanced breakfast", Maya is part of a well-balanced fitness regimen. Something a little more traditional alongside the music games and the Kilowatt-mediated shoot-em-ups. Good for what ails ya.